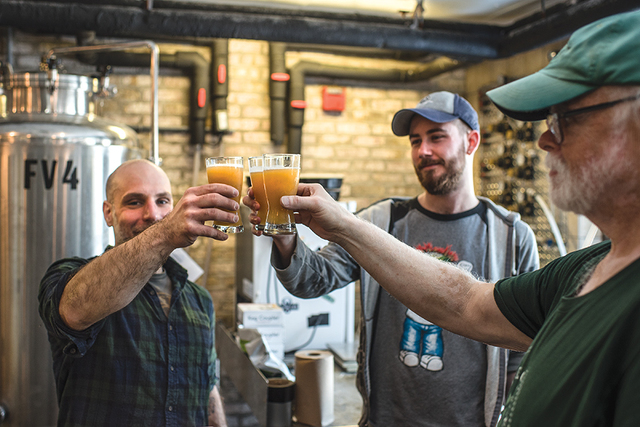 (Photos by Darren Andrew Weimert) Writer Vincent Corso (left) shares a toast to a well-brewed beer with Warren Skopowski and Denny Bannon. Vince gets ready to mix the mash. Sitting in my basement, next to a lot of other passing fancies that I’ve had over the years, is a beer-brewing kit. It’s right next to a guitar I never play. My partner, Becky, gifted me the brew kit as a birthday present about eight years ago and after I brewed one batch of beer with my buddy Ryan (he did most of the work), the kit has gathered dust ever since. An abundance of hops overtake one of Becky’s flower beds each summer and she is always threatening to rip them all out if I don’t use them, so I figured I better get to brewing before she finally follows through. But before I break out the old buckets from the basement, I figured I better go to a professional for some help. I asked Chris Schell, head brewer at Robin Hood Brewing Company in Bellefonte, if he could teach me his art. Chris has been the head brewer at Robin Hood since Home D Pizzeria decided to get into the beer-brewing business five years ago. Chris learned the brewing technique at a couple of brewpubs in his home state of New York and was ready to run his own brewery at the age of 25. The large, steel tank and pressurized water systems at Robin Hood are much more high-tech than a homebrewer is typically going to encounter, so to help put it all in perspective, Chris asked Denny Bannon of the State College Homebrew Club to join us as we made our brew. Chris, Denny, and assistant brewer Warren Skopowski can talk forever about brewing technique. All agree that with a home brewing kit similar to mine, a layman can make some high-quality brew. “Don’t let our secret out,” Chris said with a laugh. A great resource for newbies and experts alike, the Homebrew Club meets monthly and members share their beers and talk technique. Over at Robin Hood, our first step was to weigh grains. Brewers like Chris are part of the growth of brewing over the past 20 years and have put America on the forefront of inventing new, tasty beer. We were making a New England-style IPA. As a beer lover, I enjoy typical West Coast IPAs with all their hoppy goodness, but for many, the overpowering bitterness of the hops is too much. 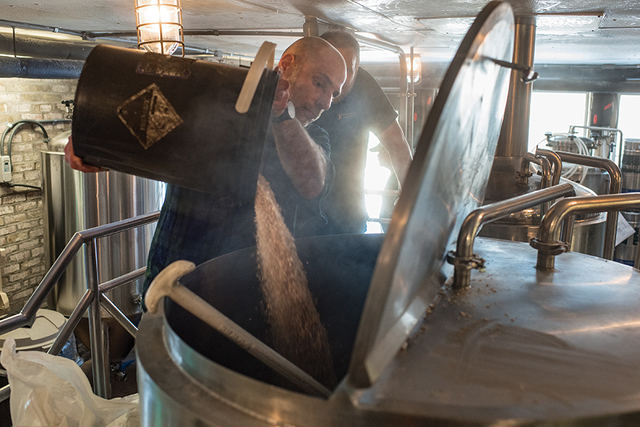 But the mixture of malted wheat and flaked oat with the barley give the beer the correct texture, and a back-loaded mixture of hops helps New England-style IPA offer a little more subtle and smooth fruity hop flavor, Chris says. These New England-style IPA’s are all the rage in the brewing world right now, and it is easy to see why. As the water started filling in the vat, we started mixing in all the grains, making what is called the mash. It was difficult mashing in the grains with a large paddle, and Denny joked that it was like kayaking. I got a chuckle out of that, but I broke out in a sweat as we stirred the heavy mixture. This process uses natural enzymes in the malt to break down the malt’s starch into sugars. The sugars are what the yeast will later turn to alcohol. A malty smell filled the air and it felt like were going somewhere. In between bags of grains, Chris added phosphoric acid and brewing salts to keep the pH balance of the mash in check. This is important because if the pH is off, the grains could leach tannins to the wort, and that could make the beer more astringent and add to the hangover of anyone who drinks it. After the mash rested for 30 minutes, what’s called the vorlauf process had the mash recirculate over itself. Then in the lautering process, the beer is separated from the grains into a kettle. This includes the sparge, in which a sprinkle of water is run over the top of the leftover grain to get any leftover sugars into the mixture. This took a while and as we were waiting, Warren was getting ready to place another beer into kegs. Denny, Warren, and I got to taste the beer, which was similar to the brew we were making. It was refreshing, and in the perfect environment with our beer brewing nearby. “It is never a bad day when you are brewing beer,” Denny said as we tasted our sample. And he was right. At times during the day, various people from the bar stopped in to see how things were going and to let Chris know how much they liked this beer or that. Next, the liquid portion called wort was brought to a boil and the leftover grains were then removed from the tank. Robin Hood’s leftover grains are used by a farmer to feed livestock. When the wort was brought to a boil, the fresh-smelling hops were added to provide bitterness. The wort was then boiled for an hour. Ten minutes before the end of the boil, we added an Irish moss concoction that helps clarify and provides added nutrients to the beer, giving the yeast a little something else to eat. Then we added more hops to help provide more citrus flavor. After the boil, the wort was transferred into the whirlpool that churns the beer to draw some of the leftover matter away from the clear wort. More hops were added at this point (after all this is an IPA) for aroma. Warren and Chris were busy throughout, cleaning everything to make sure that no containments get mixed into the brew. The brewing process requires a sterile environment, so keeping things clean is a brewer’s No. 1 job. The next step was to knock the wort out into the fermenter. This process pumps the wort through a heat exchanger to cool it to room temperature, which is what the yeast likes. Yeast is added and it starts converting the sugars from the grains into alcohol and carbon dioxide. This process goes on for five to seven days, until the yeast goes dormant when it runs out of sugar to eat. The yeast is collected from the beer and used again in the next batch. More dry hops are then added and the beer is chilled for three to five days. Then the beer is carbonated in the bright tank. Then we are in business, and the beer is kegged and ready to drink. Perfect for spring, the beer we brewed is called In Bloom, and it taste just like it sounds, floral but not overly so. The beer has a nice pale straw color and looks picturesque in the glass. The sweetness balances out the bitterness nicely. You should check it out and say hi to Chris in the brewery when you are there. Robin Hood sells its beer on tap at the brewpub and ships it out in kegs to many different establishments, but is looking at expanding to add a canning line sometime soon so that its beers can be even more available. What a treat to be able to have Chris’s tasty brews in cans soon. In the meantime, it was with great satisfaction that I got to drink this beer that I helped create. So, as my hops come into bloom this season, I feel ready to get those buckets out of the basement and call up my buddy Ryan to brew my very own batch of In Bloom.